Most people can wear contact lenses. Some eyes are unusual but we specialise in the complicated contact lenses too. If you've been told in the past that you're not suitable for contact lenses, why not ask us at Cottam and Glaister if that's still the case? As we are independent, we can fit any contact lens in the world, so there's usually something we can do for you. If you have an up-to-date contact lens prescription from another optician, we're happy to supply you with the lenses on the prescription. 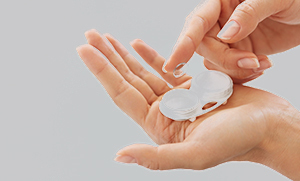 If you're new to contact lenses altogether, you'll need to book in for a contact lens fitting. We'll need to do an eye examination first if it's been more than a year since you had one or if we've never seen you before. Then we'll talk you through the choices of contact lenses and make a recommendation based on your eyesight, your lifestyle and how much you're intending to wear the contact lenses. We'll take some measurements and check the front of your eye on a microscope before putting a pair of lenses on your eyes for you. We then let you go out for an hour or so to see what you think before checking the lenses fit correctly. If you're happy with the experience, we'll show you how to get them in and out. Once you've mastered this, you'll take some lenses home and return for a check-up about a week later. If all is well, we'll order you a three or six month supply and check your eyes after that. We normally check our contact lens wearers every six months.